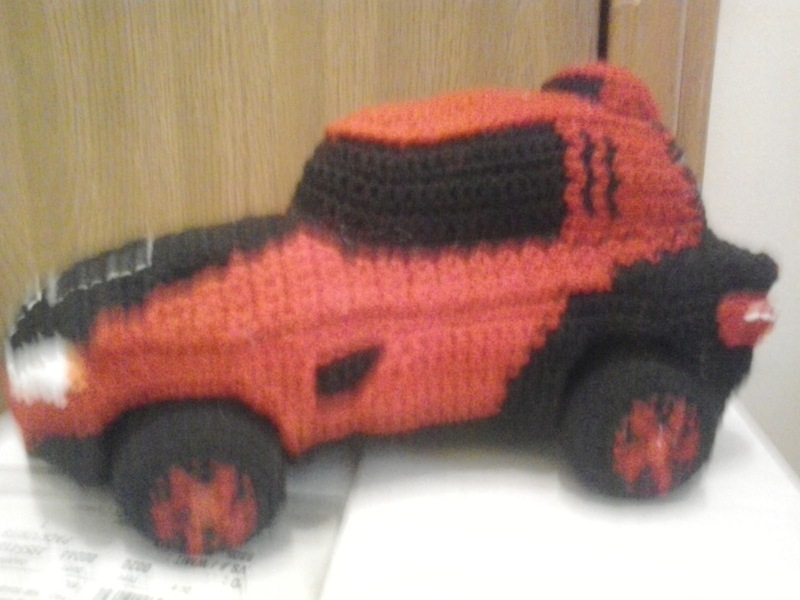 This is a sports car based drawing a car that is an Etsy customer’s dream car. I did my best to bring his fantasy to reality in plush form. The car can be made in any combination of colors. The Sports car in the picture was made with the colors requested. Worsted weight yarn: Black, red, orange, grey heather and white. Rw 18: Ch 3, sc in next 18 sc of Rw 18. Rw 7: Ch 1, turn; sc in next 6 sc, ch 1, skip next sc, sc in next 6 sc. Finish off leaving a long tail. Sew WHEELWELL TOPS to WHEELWELL BACKS. Sew assembled WHEELWELLS to BOTTOM. Finish off leaving a long tail. OPTIONAL: Glue dowel to TIRES through opening in Rd 13. Weave tail through sc of Rd 13, pull tightly and secure. Sew TIRES to WHEELWELL BACK. OPTIONAL: Use buttons to attach TIRES so that they can turn. Rw 3: Ch ,1 turn; sc in next 4 sc, change to red, sc in next 2 sc, change to black, sc in next 3 sc, sc2tog, leaving remaining sc unworked. (10) Change to red. Rw 4: Ch 1, turn; sc2tog, sc in next 5 sc, change to black, sc in next 3 sc. (9) Change to red. Finish off leaving a long tail. Sew RADIATOR VENT behind opening in FRONT. Rw 8: Ch 1, turn; sc in next 3 sc, 2 sc in next sc, ch 5, working in sc of LEFT FRONT, 2 sc in next sc, sc in next sc, change to orange, sc in next sc, change to white, sc in next 2 sc, sc2tog. Rw 9: Ch 1, turn; sc3tog, change to orange, sc in next sc, change to red, sc in next 3 sc, sc in next 5 ch, sc in next 5 sc. Rw 8: Ch 1, turn; sc in next 5 sc, 2 sc in next sc, ch 5, working in sc of DRIVER’S SIDE RIGHT HALF, 2 sc in next sc, sc in next 2 sc, change to red, sc in next 10 sc, sc2tog, ch 6, slip st in side of Rw 8 of LEFT HALF AND DRIVER’S FRONT QUARTER PANEL. Rw 9: Slip st up to Rw 9 of LEFT HALF AND DRIVER’S SIDE FRONT QUARTER PANEL, ch 1, turn; sc in next 6 ch, sc in next 12 sc, change to black, sc in next 3 sc, sc in next 5 ch, sc in next 6 sc, 2 sc in next sc. Rw 11: Ch 1, turn; 2 sc in next sc, sc in next 9 sc, sc2tog. Finish off. Weave in ends. Sew WHEELWELLS to QUARTER PANELS. Finish off. Weave in ends. Sew SIDE VENTS to backside of opening in SIDES. Rw 8: Ch 1, turn; sc in next 3 sc, 2 sc in next sc, ch 5, working in sc of RIGHT FRONT, 2 sc in next sc, sc in next sc, change to orange, sc in next sc, change to white, sc in next 2 sc, sc2tog. Rw 8: Ch 1, turn; sc in next 5 sc, 2 sc in next sc, ch 5, working in sc of PASSENGER’S SIDE LEFT HALF, 2 sc in next sc, sc in next 2 sc, change to red, sc in next 10 sc, sc2tog, ch 6, slip st in side of Rw 8 of RIGHT HALF AND PASSENGER’S FRONT QUARTER PANEL. Rw 9: Slip st up to Rw 9 of RIGHT HALF AND PASSENGER’S SIDE FRONT QUARTER PANEL, ch 1, turn; sc in next 6 ch, sc in next 12 sc, change to black, sc in next 3 sc, sc in next 5 ch, sc in next 6 sc, 2 sc in next sc. Rw 3: Ch 1, turn; sc in next 6 sc, change to black, sc in next 12 sc, change to grey heather, sc in next 6 sc. (24) Change to black. Rw 5: Ch 1, turn; sc in next sc, (sc, ch 1, slip st) in next sc, slip st in next 4 sc, (slip st, ch 1, sc) in next sc, sc in next 2 sc, change to red, sc in next sc, change to black, sc in next 4 sc, change to red, sc in next sc, change to black, sc in next 2 sc, (sc, ch 1, slip st) in next sc, slip st in next 4 sc, (slip st, ch 1, sc) in next sc, sc in next sc. Rw 6: Ch 1, turn; sc in next 2 sc, ch 4, skip next 4 sc, sc in next 2 sc, change to red, sc in next 2 sc, change to black, sc in next 4 sc, change to red, sc in next 2 sc, change to black, sc in next 2 sc, ch 4, skip next 4 sc, sc in next 2 sc. Change to red. SEW BACK VENTS IN PLACE. Finish off. Weave in ends. Using black, embroider tail pipes and logo. Finish off leaving a long tail. Using white, embroider white turn signals. Sew TAIL LIGHTS on SPORTS CAR. Rw 9: Ch 1, turn; sc in each sc across. (20) Change to red. Rw 18: Ch 1, turn; sc in next 3 sc, ch 2, change to black, sc in next 10 sc on CENTER, ch 2, change to red, sc in next 3 sc. Rws 24-42: Ch 1, turn; sc in each sc across. (20) Change to black after Rw 42. Finish off. Weave in ends. Using grey heather, embroider outline of HOOD. Using white, embroider logo. Sew HOOD AND TOP OF BODY to BODY STUFFING BEFORE CLOSING. Finish off leaving a long tail. Sew BACK WINDOW to sides of COCKPIT TOP. Sew assembled COCKPIT TOP to BODY of SPORTS CAR. Finish off leaving a long tail. Sew COCKPIT TOP VENT to COCKPIT adding a small amount of stuffing before closing.